The Multi-Threat-Shield (MTS) from Force Training Institute can stop a .44 Magnum cold, withstand a knife attack and hold your iPad all while weighing only 8lbs. It does this through a hidden layer of ballistic grade laminated kevlar that is stitched inside the fabric of the bag. In an emergency situation the user grabs the bag and with a flick of the wrist it unfolds into a 3-foot long personal shield. The MTS isn’t just bulletproof either – the Kydex blunt force inserts also protect against kicks and punches once the baddies run out of bullets. 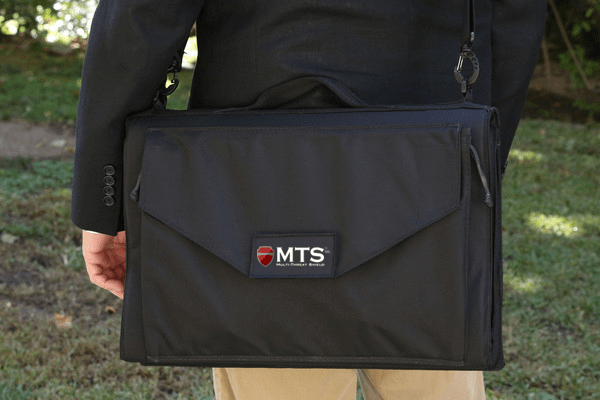 Being that most days in the office don’t begin with a shootout, there’s also an expandable pouch built into the MTS that allows for more mundane tasks such as holding a laptop and that report for Dave.